The curriculum, which is based on field-tested techniques, provides a fun and orderly way to learn proper ATV/Quad operation. The rider learns about controls, reading terrain, turning and climbing hills. A signed consent form is required from the parent or legal guardian, if the child is between 6 and 11 years of age. No child will be allowed to ride without written parental consent. The ATV Rider's Course is available for children under the age of 14 whose parents specifically permit them to ride ATV/Quads. 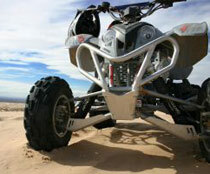 The vehicle must be the proper size for the child as per ATV industry safety standards. Children will receive a Canada Safety Council Certificate upon successful completion of the ATV Riders Course.